Glory is a 1989 American epic war film directed by Edward Zwick and starring Matthew Broderick, Denzel Washington, Cary Elwes and Morgan Freeman. The screenplay was written by Kevin Jarre, based on the personal letters of Colonel Robert Gould Shaw, the novel One Gallant Rush by Peter Burchard (reissued in 1990 after the movie), and Lay This Laurel (1973), Lincoln Kirstein's compilation of photos of the monument to the 54th Massachusetts Volunteer Infantry on Boston Common. The film was co-produced by TriStar Pictures and Freddie Fields Productions, and distributed by Tri-Star Pictures in the United States. It premiered in limited release in the U.S. on December 14, 1989, and in wide release on February 16, 1990, making $26,828,365 on an $18 million budget. The soundtrack, composed by James Horner and performed in part by Boys Choir of Harlem, was released on January 23, 1990. The home video was distributed by Sony Pictures Home Entertainment. On June 2, 2009, a widescreen Blu-ray version, featuring the director's commentary and deleted scenes, was released. During the American Civil War, Captain Robert Shaw is injured in the Battle of Antietam and sent home to Boston on medical leave. He visits his family there, where he meets the abolitionist Frederick Douglass, a former slave. Shaw is offered a promotion to the rank of Colonel to command one of the first all-black regiments in the Union Army, the 54th Regiment Massachusetts Volunteer Infantry. He accepts and asks his childhood friend, 2nd Lieutenant Cabot Forbes, to serve as his second in command, with the rank of major. Their first volunteer is another friend, Thomas Searles, a bookish free African American. Other recruits soon follow, including battlefield gravedigger John Rawlins, timid freeman Jupiter Sharts, cantankerous slave escapee Silas Trip, and a teenage drummer boy who is mute. Trip instantly clashes with Searles and Rawlins is forced to keep the peace between them. The men learn that, in response to the Emancipation Proclamation the Confederacy has issued an order that all black soldiers will be returned to slavery, that all black soldiers found in Union uniform will be summarily executed, and so will their white officers, and the troops are offered a chance to take an honorable discharge, but none of them do. The black soldiers undergo a severe training regimen under Irish Sergeant-Major Mulcahy. When Shaw confronts Mulcahy about his methods he comes to realize that Mulcahy is in fact training them fairly and is trying to prepare the men for the extreme challenges that they will face. When Trip goes AWOL and is caught, Shaw orders him flogged in front of the troops. The scars from his beatings as a slave are exposed, giving pause to the abolitionist Shaw. While talking to Rawlins, Shaw discovers that Trip had left to find shoes to replace his worn ones. Shaw learns that his men are being denied regular supplies and confronts the base's racist quartermaster on their behalf. He further supports them through a pay dispute, as the Federal government decided to pay black soldiers $10/month as opposed to the $13/month that white soldiers earn. Trip encourages the men to go without pay in protest, and Shaw tears up his own pay stub in solidarity, earning the respect and admiration of his men. In recognition for his leadership among the troops, Shaw promotes Rawlins. As black soldiers are forbidden from being commissioned as officers, Rawlins is invested with the rank of Sergeant-Major: the highest rank an enlisted man can receive. Once the 54th completes its training, they are transferred under the command of General Charles Garrison Harker. On the way to joining the war in South Carolina, the 54th is ordered, by Harker's second-in-command, Colonel James Montgomery, to sack a Georgia town, and then burn it. Though Shaw initially refuses to obey an unlawful order, he ultimately obeys under threat of being relieved and having his troops taken away, and the town is destroyed. Shaw continues to lobby his superiors to allow his men to join the fight, as their duties since being activated involved construction and manual labor. Shaw finally gets the 54th into combat after he confronts Harker and threatens to report the smuggling, looting, and graft he has discovered unless Harker orders the 54th into action. In their first battle on James Island, South Carolina, early success is followed by a bloody confrontation with many casualties. However, the Confederates are defeated and retreat. During the battle, Thomas is wounded but saves Trip, finally earning the former slave's respect. He subsequently refuses to go home to recover. Shaw offers Trip the honor of bearing the regimental flag in battle, but he declines. Trip states that he doesn't believe the war will result in a better life for slaves, but at the same time that he knows he must fight for the mere hope that it might. Sometime after, General George Strong informs Shaw and his other staff officers of a major campaign to secure a foothold in Charleston Harbor. This will involve assaulting the nearby Morris Island and capturing its impenetrable fortress, Fort Wagner. The fort's only landward approach is via a small strip of beach with little cover, and the first regiment to charge is sure to suffer extremely heavy casualties. Shaw volunteers to have the 54th spearhead the charge. The night before the battle; the black soldiers conduct a religious service where individual soldiers offer their prayers amid hymn singing. Jupiter, Rawlins, and Trip make emotional speeches to inspire the troops and to ask for God's help. The 54th leads the charge on the fort and heavy casualties ensue from artillery fire. As night falls, the bombardment continues, forestalling progress. Attempting to spur his men forward, Shaw is shot and killed. Trip lifts up the flag and rallies the soldiers to continue the charge, even as Rawlins provides covering fire. Trip is shot several times while doing so but holds up the flag to his last breath. Forbes takes charge of the regiment, and the soldiers are able to break through the fort's outer defenses but find themselves greatly outnumbered, leading to the death of Charlie Morse and the wounding of Thomas in the back. At the end of the battle it is implied that Forbes, Rawlins, Thomas, Jupiter, and the two Color Sergeants are killed by cannon fire. The morning after the battle, the beach is shown littered with bodies of Union soldiers and the Confederate flag is raised over the fort. The corpses are buried in a mass grave, with Shaw and Trip's bodies next to each other. The closing narration reveals that Fort Wagner was never taken by the Union Army but that the courage demonstrated by the soldiers of the 54th resulted in the Union accepting thousands of black men for combat, which President Abraham Lincoln credited with helping to turn the tide of the war. Kevin Jarre's inspiration for writing the film came from viewing a monument to Colonel Shaw and the 54th Massachusetts Volunteer Infantry (the first formal unit of the U.S. Army to be made up entirely of African American men) in Boston Common. Jarre's screenplay was based on Colonel Shaw's letters and on two books, Lincoln Kirstein's Lay This Laurel and Peter Burchard's One Gallant Rush. He then based the story on letters written by Shaw during the Civil War. Principal filming took place primarily in Massachusetts and Georgia. Opening passages, meant to portray the Battle of Antietam, were volunteer military reenactors filmed at a major engagement at the Gettysburg battlefield. Zwick did not want to turn Glory "into a black story with a more commercially convenient white hero." 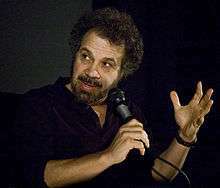 Actor Freeman noted, "We didn't want this film to fall under that shadow. This is a picture about the 54th Regiment, not Colonel Shaw, but at the same time the two are inseparable." Zwick hired the writer Shelby Foote as a technical adviser; he later became widely known for his contributions to Ken Burns' popular PBS nine-episode documentary, The Civil War (1990). Glory was the first major motion picture to tell the story of African Americans fighting for their freedom in the Civil War and came as a revelation to millions of Americans who had no knowledge of their participation. The 1965 movie Shenandoah, starring James Stewart, also depicted African Americans fighting for the Union, but suggested that the Federal army was integrated. 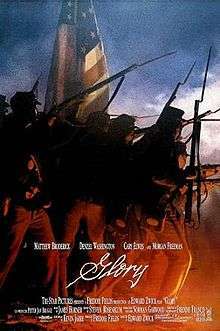 The original motion picture soundtrack for Glory was released by the Virgin Records label on January 11, 1990. The score for the film was orchestrated by James Horner in association with the Boys Choir of Harlem. Jim Henrikson edited the film's music, while Shawn Murphy mixed the score. A nonfiction study of the regiment appeared first in 1965 and was republished in paperback by St. Martin's Press, One Gallant Rush: Robert Gould Shaw and His Brave Black Regiment, in January 1990. The book dramatizes the events depicted in the film, expanding on how the 54th Massachusetts developed as battle-ready soldiers. The book summarizes the historical events and the aftermath of the first Union black regiment influencing the outcome of the war. Vincent Canby, writing in The New York Times, said, "[Broderick] gives his most mature and controlled performance to date....[Washington is] an actor clearly on his way to a major screen career...The movie unfolds in a succession of often brilliantly realized vignettes tracing the 54th's organization, training and first experiences below the Mason-Dixon line. The characters' idiosyncrasies emerge." Roger Ebert in the Chicago Sun-Times called it "a strong and valuable film no matter whose eyes it is seen through." He believed the production design credited to Norman Garwood and Freddie Francis paid "enormous attention to period detail". Ebert just had one qualm about the film wondering why a "black experience" had to be seen "largely through white eyes." "Glory is constructed as an inspirational tale, but the inspiration is not forced or false. It is rooted in the characters and the manner in which they overcome obstacles, including, most prominently, their own personal demons." Similarly, the Variety staff wrote that the film is "a stirring and long overdue tribute to the black soldiers who fought for the Union cause in the Civil War" and that the film "has the sweep and magnificence of a Tolstoy battle tale or a John Ford saga of American history." On Broderick's performance, they believed his "boyishness becomes a key element of the drama, as the film shows him confiding his inadequacies". Desson Howe of The Washington Post, stated that with Glory, "it's hard not to get carried along". He praised the individual cinematic elements saying the motion picture was "a thoroughly pleasant experience, a lightweight, liberal-heart-swollen high." He did, however, point out some flaws by mentioning Broderick as "an amiable non-presence, creating unintentionally the notion that the 54th earned their stripes despite wimpy leadership". Jonathan Rosenbaum of the Chicago Reader, rated Glory as "pretty watchable" and called it an "always interesting period film, well photographed by English cinematographer Freddie Francis." The film, however, was not without its detractors. Peter Travers of Rolling Stone was not impressed at all with the overall acting, calling Broderick "catastrophically miscast as Shaw". Alternatively, Richard Schickel of Time described the picture by saying, "the movie's often awesome imagery and a bravely soaring choral score by James Horner that transfigure the reality, granting it the status of necessary myth." Writing for Entertainment Weekly, Mark Bernardin said the film's strength "belongs to the powerhouse supporting cast – Morgan Freeman, Andre Braugher (in his first movie role), and Denzel Washington". He added: "The magic of Glory comes from the film itself. It speaks of heroism writ large, from people whom history had made small." James Berardinelli writing for ReelViews, called the film "without question, one of the best movies ever made about the American Civil War," and noted that it "has important things to say, yet it does so without becoming pedantic" Berardinelli also commented: "For a motion picture made on a relatively modest budget, Glory looks great. From a technical standpoint, the movie is a masterpiece, and the verisimilitude of the battle scenes is not in question." Marjorie Baumgarten of The Austin Chronicle, called it a "fabulous historical re-creation [that] depicts the experiences of America's first unit of black soldiers in the Civil War and the young Northerner who leads them." Rating the film with four stars, critic Leonard Maltin wrote that the film was "grand, moving, breathtakingly filmed (by veteran cinematographer Freddie Francis) and faultlessly performed". He wrote that it was "one of the finest historical dramas ever made." "Watching "Glory," I had one reccuring [sic] problem. I didn't understand why it had to be told so often from the point of view of the 54th's white commanding officer. Why did we see the black troops through his eyes — instead of seeing him through theirs? To put it another way, why does the top billing in this movie go to a white actor?" Chris Hicks of the Deseret News said the film is "big in scope, powerful in its storytelling drama, yet intimate in its character and relationship development." Referring to Broderick, he found the acting "does very well as the young officer, and among his troops are two of our finest actors — Morgan Freeman...and Denzel Washington." In Time Out, author CM wrote that in terms of authenticity, "the battle sequences are truly impressive" and "the stark clarity of Freddie Francis' cinematography combined with Zwick's intimate style evokes immediacy and fear." On another positive front, the staff of TV Guide said of the production values of the film, "Richly plotted, alternately inspiring and horrifying, Glory is an enlightening and entertaining tribute to heroes too long forgotten." On the acting merits, they wrote, "Glory also contains especially compelling performances by Broderick, Washington, and Freeman." Film critic Gene Siskel of the Chicago Tribune gave the film a thumbs up review, saying, "like Driving Miss Daisy, this is another admirable film that turns out to be surprisingly entertaining." He thought the film took on "some true social significance" and felt the actors portrayed the characters as "more than simply black men." He explained: "They're so different, that they become not merely standard Hollywood blacks, but true individuals." American Civil War historian James M. McPherson also lauded the film, saying that it "accomplished a remarkable feat in sensitizing a lot of today's black students to the role that their ancestors played in the Civil War in winning their own freedom." On Rotten Tomatoes, the film holds an approval rating of 93% based on 41 reviews, and an average rating of 7.9/10. The site's consensus reads, "Bolstered by exceptional cinematography, powerful storytelling, and an Oscar-winning performance by Denzel Washington, Glory remains one of the finest Civil War movies ever made." The film was nominated and won several awards in 1989–90. Among awards won were from the Academy Awards, the Kansas City Film Critics Circle Awards and the Golden Globe Awards. A complete list of awards the film won or was nominated for are listed below. The film premiered in cinemas on December 14, 1989 in limited release within the U.S.. During its limited opening weekend, the film grossed $63,661 in business showing at 3 locations. Its official wide release was screened in theaters on February 16, 1990. Opening in a distant 8th place, the film earned $2,683,350 showing at 801 cinemas. The film Driving Miss Daisy soundly beat its competition during that weekend opening in first place with $9,834,744. The film's revenue dropped by 37% in its second week of release, earning $1,682,720. For that particular weekend, the film remained in 8th place screening in 809 theaters not challenging a top five position. The film Driving Miss Daisy, remained in first place grossing $6,107,836 in box office revenue. The film went on to top out domestically at $26,828,365 in total ticket sales through a 17-week theatrical run. For 1989 as a whole, the film would cumulatively rank at a box office performance position of 45. Following its release in theaters, the film was released in VHS video format on June 22, 1990. The Region 1 Code widescreen edition of the film was released on DVD in the United States on January 20, 1998. Special features for the DVD include, interactive menus, scene selections, widescreen 1.85:1 color anamorphic format along with subtitles in English, Italian, Spanish and French. A special edition repackaged version of Glory was also officially released on DVD on January 2, 2007. The DVD set includes two discs featuring; widescreen and full screen versions of the film; Picture-in-Picture video commentary from director Ed Zwick and actors Morgan Freeman and Matthew Broderick; a director's audio commentary; a documentary entitled, "The True Story of Glory Continues" narrated by Morgan Freeman; an exclusive featurette entitled, "Voices of Glory"; an original featurette; deleted scenes; production notes; theatrical trailers; talent files; and scene selections. The Blu-ray disc version of the film was released on June 2, 2009. Special features include a virtual civil war battlefield, interactive map, "The Voice Of Glory" feature, "The True Story Continues" documentary, the making of Glory, director's commentary, and deleted scenes. The film is displayed in widescreen 1.85:1 color format in 1080p screen resolution. The audio is enhanced with Dolby TruHD sound and is available with subtitles in English, Spanish, French, and Portuguese. A UMD version of the film for the Sony PlayStation Portable was also released on July 1, 2008. The disc features dubbed, subtitled, and color widescreen format viewing options. ↑ "Glory". The Numbers. Retrieved November 7, 2010. 1 2 3 "Glory". Box Office Mojo. Retrieved November 7, 2010. 1 2 3 4 Ebert, Roger (January 12, 1990). Glory.Chicago Sun-Times. Retrieved 2010-11-07. 1 2 Canby, Vincent (December 14, 1989). Glory (1989). The New York Times. Retrieved 2010-11-07. 1 2 3 "Glory (1989)". Turner Classic Movies. Retrieved November 7, 2010. ↑ Glory Original Motion Picture Soundtrack. Barnes & Noble. Retrieved 2010-11-07. ↑ "Glory (1989) Cast and Credits". Yahoo! Movies. Retrieved November 7, 2010. 1 2 Burchard, Peter (1990). 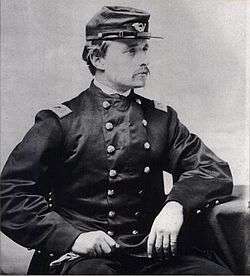 One Gallant Rush: Robert Gould Shaw and His Brave Black Regiment. St. Martin's Press. ISBN 978-0-312-04643-9. 1 2 3 Berardinelli, James (December 1989). Glory. ReelViews. Retrieved 2010-11-07. ↑ Glory. Variety (December 31, 1988). 1 2 3 Desson, Howe (January 12, 1990). 'Glory' (R). The Washington Post. Retrieved 2010-11-07. ↑ Rosenbaum, Jonathan (December 1989). Glory. Chicago Reader. Retrieved 2010-11-07. ↑ Travers, Peter (December 1989). Glory (1989). Rolling Stone. Retrieved 2010-11-07. ↑ Schickel, Richard (December 5, 1989). Cinema: Of Time and the River. TIME. Retrieved 2010-11-07. ↑ Bernardin, Mark (February 13, 2001). Glory: Special Edition (2001). Entertainment Weekly. Retrieved 2010-11-07. ↑ Baumgarten, Marjorie (February 7, 2001). Glory. The Austin Chronicle. Retrieved 2010-11-07. ↑ Maltin, Leonard (August 5, 2008). Leonard Maltin's 2009 Movie Guide. Signet. p. 528. ISBN 978-0-452-28978-9. ↑ Hicks, Chris (February 20, 1990). Glory. Deseret News. Retrieved 2010-11-07. ↑ CM (December 1989). Glory (1989). TimeOut. Retrieved 2010-11-07. ↑ Glory: Review. TV Guide (December 1989). ↑ Siskel, Gene (December 1989). Glory. At the Movies. Retrieved 2010-11-07. ↑ McPherson, James M.; Lamb, Brian (May 22, 1994). "James McPherson: What They Fought For, 1861-1865". Booknotes. National Cable Satellite Corporation. Archived from the original on March 9, 2016. Retrieved March 9, 2016. Glory accomplished a remarkable feat in sensitizing a lot of today's black students to the role that their ancestors played in the Civil War in winning their own freedom. ↑ "Glory: Awards & Nominations". MSN Movies. Retrieved November 7, 2010. ↑ "Glory (1989) Awards & Nominations". Yahoo! Movies. Archived from the original on 2008-02-16. Retrieved November 7, 2010. ↑ "Nominees & Winners for the 62nd Academy Awards". Academy of Motion Picture Arts and Sciences. March 26, 1990. Archived from the original on February 21, 2014. Retrieved January 24, 2016. ↑ "Nominees & Recipients". American Cinema Editors. Retrieved November 7, 2010. ↑ "Film Nominations 1990". British Academy of Film and Television Arts. Archived from the original on December 26, 2007. Retrieved January 24, 2016. ↑ "Best Cinematography Award". The British Society of Cinematographers. Archived from the original on 2009-04-14. Retrieved November 7, 2010. ↑ "Artios Award Winners". CastingSociety.com. Retrieved November 7, 2010. ↑ "Glory". GoldenGlobes.org. Retrieved November 7, 2010. ↑ "Videos for 33rd Annual Grammy Awards". Grammy.com. Retrieved November 7, 2010. ↑ "KCFCC Award Winners 1980-1989". kcfcc.org. Archived from the original on 2009-04-10. Retrieved November 7, 2010. ↑ "Image Awards History". NAACP Image Awards. Archived from the original on 2006-03-30. Retrieved November 7, 2010. ↑ "Naacp's Image Awards Honor Black Entertainers". Orlando Sentinel. Retrieved November 7, 2010. ↑ "Awards for 1989". National Board of Review. Retrieved November 7, 2010. ↑ "1989 Awards". New York Film Critics Circle. Archived from the original on 2006-11-09. Retrieved November 7, 2010. ↑ "Previous Winners". Political Film Society. Archived from the original on October 28, 2009. Retrieved November 7, 2010. ↑ "Awards Winners". Writers Guild Awards. Retrieved November 7, 2010. ↑ "February 16–19, 1990 Weekend". Box Office Mojo. Retrieved November 7, 2010. ↑ "October 23–25, 1990 Weekend". Box Office Mojo. Retrieved November 7, 2010. ↑ "1989 Domestic Grosses". Box Office Mojo. Retrieved November 7, 2010. ↑ "Glory VHS Format". Amazon.com. Retrieved November 7, 2010. ↑ "Glory DVD". DVDEmpire.com. Retrieved November 7, 2010. ↑ "Glory Special Edition". Amazon.com. Retrieved November 7, 2010. 1 2 "Glory Blu-ray". DVDEmpire.com. Retrieved November 7, 2010. ↑ "Glory UMD for PSP". Amazon.com. Retrieved November 7, 2010.